Planning and zoning consists of a proactive approach to determining the City’s future. Through a Master Planning process, the City can envision what it wants to be and how to get there. The Master Plan is shaped around the value of the environment and the vision of the community. Good planning dictates future land use and zoning laws for our City. Please visit the Ridgeland Area Master Plan (RAMP) for further information. The Ridgeland Area Master Plan Progress Report 2012 reveals notable projects and achievements since the RAMP’s adoption in 2008. Citizens and interested parties are invited to review the report and learn more about what the City of Ridgeland has accomplished and where the City will focus its efforts in the future. 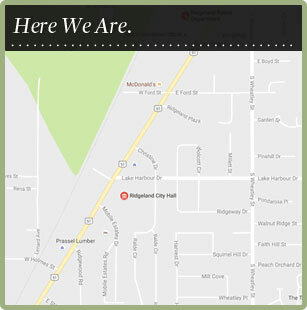 Click to view the City of Ridgeland’s Comprehensive Plan and Future Land Use Plan Map. Need to find the zoning of a particular property? Go to City Maps to obtain a copy of the City’s zoning map. The U.S. Department of Treasury and the Internal Revenue Service designated 100 Mississippi Communities as Qualified Opportunity Zones in 2018. Ridgeland was selected to have a Qualified Opportunity Zone. • It allows potential investors to temporarily defer the recognition of gain invested in a qualified opportunity fund (“Opportunity Fund”) within 180 days from the sale or exchange creating the gain; a possible step-up in the basis of their investment, and a possible permanent exclusion of the appreciation on such investments if the holding period is at least 10 years. • The investments in the Opportunity Funds are intended to specifically encourage investments that will be used to start businesses, develop abandoned properties or provide low-income housing in low-income, economically distressed communities. The investments are intended for new businesses or to substantially improve the existing business property within 30 months. • The Opportunity Funds will use the proceeds from such investment to acquire either (a) stock or partnership interests in a business that use its business property in Qualified Opportunity Zones or (b) business property in Qualified Opportunity Zones. If you would like information on the Ridgeland Opportunity Zone, please contact Alan Hart or Bryan Johnson at 601-856-3877. For more information about Qualified Opportunity Zones please visit, U.S. Department of the Treasury Community Development Financial Institutions Fund and The Internal Revenue Service Frequently Asked Questions Page on Opportunity Zones. Need to find the zoning ordinances? Go to Ordinances and Codes to obtain a copy of the City’s zoning ordinances. Requests can be made by either calling the City Planner at 601.856.3877 or by emailing directly to: Jordan Lohman. For faster assistance please provide the PIN or parcel id# along with a property address if applicable. Requests may take several weeks to process. Click for a sample Zoning Verification Memo. How do I apply for a rezone, conditional use, or variance? The process for rezoning, conditional use permit, and variance begins with an applicant’s completion of a petition or application form. Forms may be obtained from the Community Development Department or by going to the Licenses, Forms, and Permits section of this website. A $150 filing fee is required for all petitions upon submittal. The Community Development Department will run a legal ad in the newspaper and post a sign on the property. The applicant must notify every landowner within 160 feet of the subject property of the public hearing via certified mail. The public hearing before the Zoning Board will take place after all of the legal advertising requirements have been met. If the Zoning board approves the application/petition, then the applicant will go before the Mayor and Board of Aldermen for final approval or denial. In the event that the application is denied by the Zoning Board, the applicant may submit a written appeal to the City Clerk’s office. The written appeal must be submitted within three working days of the Zoning Board’s decision. The appeal will then be placed on the agenda for the Mayor and Board of Aldermen meeting.